The Grand is the final phase of Papago Park Center, a 350 acre mixed-use business park. 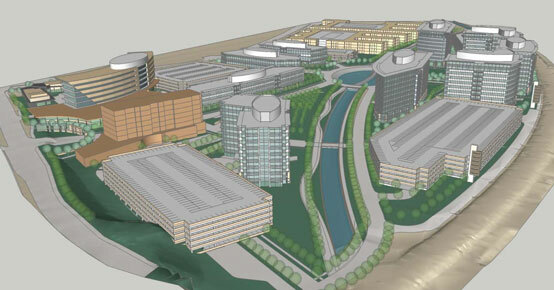 The Grand is zoned with a Planned Area Development (PAD) overlay allowing for office, retail, and hotel uses. The Grand is located between the North Priest Drive and North Center Parkway off-ramps with approximately one-half mile of frontage on the Red Mountain 202 Freeway. It has almost immediate access to Arizona State University and Phoenix Sky Harbor Airport. The I-10, 101, and 51 freeways are all within minutes of the site. The Grand has a light rail station at its northern boundary on West Washington Street. In addition, the Center Parkway station is within walking distance to the Grand's eastern boundary. A tribute to Theodore Roosevelt Dam and its place in Arizona history. Planned as the centerpiece of the Grand development, the legacy water feature is modeled to resemble the Theodore Roosevelt Dam, which is located on the Salt River 70 miles northeast of Tempe. This version of the dam will be situated on the Grand Canal, a source of water from the Salt River to the Phoenix valley since the 1870s. This water feature will include a simulated dam water release, and will create a unique atmosphere for the entire development. 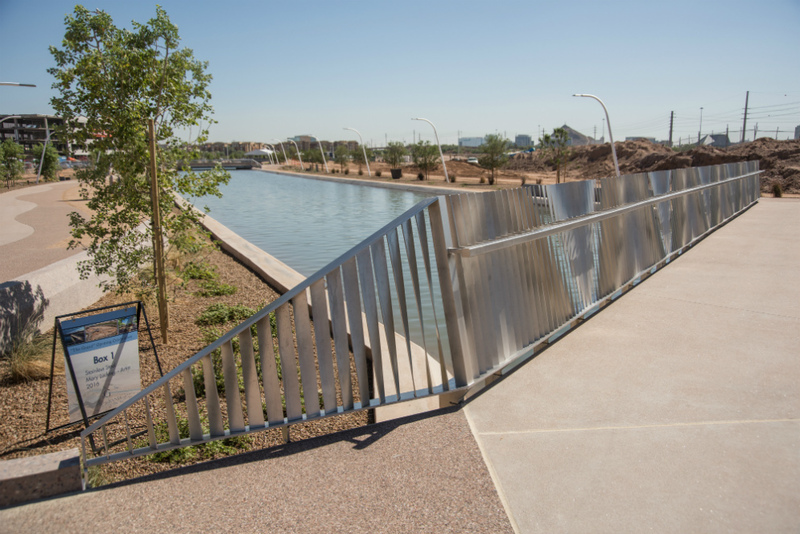 The recreational pathway at The Grand at Papago Park Center serves as a beautiful amenity to the community. Features include stunning steel bridges, gravel and pavement to accommodate runners and bikers, and a sophisticated LED lighting design that even won an IES Illumination Award. Visitors strolling along the pathway can admire the water of the canal or even spend time reading the lighted signage placed throughout that features historic quotes from Theodore Roosevelt and others who helped build the legacy of the Valley.